As I was searching for new ideas and ways to store and save beans, I ran across a video that said I could plant any type of bean bought from a grocery store and it would grow. YouTube has become one of my best friends in learning more about survival and prepping. Beans are high in protein and should be one of the main food choices you make when bulking up. 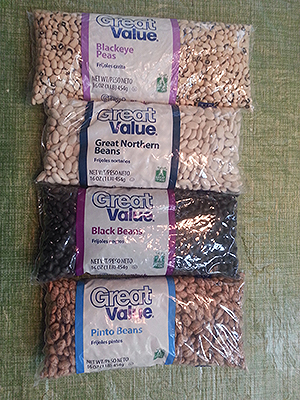 This is a picture of beans I bought from Wal-Mart just yesterday and plan to use to start my own little “bean farm”, I guess you could call it. They had other varieties, but these are the ones I stuck with. It’s kinda funny, because you can buy a high protein mix of beans on Amazon for $25 that don’t have close to even half of what I just bought for only $7.04 at Wal-Mart. Something you do have to watch for is to make sure the beans you buy don’t have lime in them. These are a generic brand and usually the cheaper brands don’t have lime. So get yourself to your local grocery store and buy up several bags of these yummy and high protein beans. You can always store what you don’t plant in your freezer until you’re ready to use them. Also, these are original heirloom beans so you can harvest these once they are ready and store them for planting the next year! 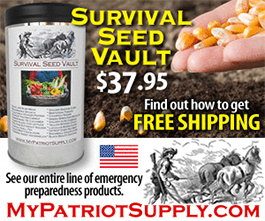 If you’re looking for a huge selection of high quality seeds and other preparedness supplies, check out Patriot Supply here.